Time for an update to our featured render, second in a row with Sandra doing poorly. I am a hobbyist 3d artist. 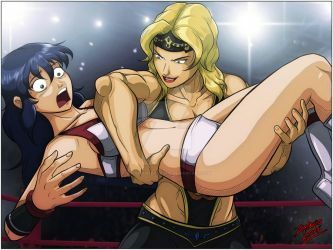 I like doing renders of cosplays and women wrestling. I also like doing renders based on real people *but* only if they give me their permission first. You can find out more about me from my blogspot (link below). You can call me Cale (not my real name) or afwfan (is my handle). Finally, I offer some freebies on the ShareCG site if you're keen to attempt your own 3D wrestling renders. A few years ago a guy named marcobertini commissioned me for a mixed render of a man delivering a pile-driver to a woman. I try not to judge, all the same I really, really, really f--king hated doing that render. But the deal was that, in exchange for the render, this guy would donate a respectable chunk of change to Doctors Without Borders. He stiffed me on payment. The deal was he had to show me a receipt with proof of his payment. Instead? Nada! Subsequent to posting my story, other artists messaged me to confirm, they too had been ripped off by the same person. So I'd wasted hours, become moderately ill, and was left with *nothing* of worth to show for it. Imagine my astonishment when I recently received a comment on one of my FvF pile-driver renders from a marcobtertini99. It would seem possible that someone has forgotten me? I have not thought about them in a long time, but I have not forgotten. Again, I will not judge. If you are happy or comfortable to create an image of a man hurting a woman with a pile-driver, I get that I'm not in a position to be sanctimonious. I would suggest however, that if the commission is from this guy, that you may wish to consider demanding payment in full and up front. Thanks for faving! And for watching! I wanted to just take a second to send you a quick note. First off I really like that you are putting matches together. Your art really makes them pop off the screen. Great work. Secondly, I downloaded your moveset (finally) off cgshare. I haven't used them yet but I wanted to thank you for putting them up for us to use. It is really appreciated. I hope when I use them I can make them look as good as you do! Good luck with the pose set - I'll be looking for your stuff. Hi Cale, downloaded your set of wrestling moves from cgshare... wanted to stop by and say thank you. Been watching your works for awhile... I havent used the poses yet, got them earlier this morning (usa) and I'm looking forward to working with them. I have a couple months under my belt using DS so I'm ok, I'm amazed by your work and a lot of others... stop by in a day or two and see your poses in action. Thanks again for sharing them, very nice and considerate. Thanks and good luck with the pose set. thank you. It seems to working pretty well. Again, thank you for making it available. Question: What are the odds of you releasing a move pack for Gen3 female, similar to the last one you released? You mean the pose set I share on ShareCG? Used pose converters and uploaded same for G3 and G8 couple months ago.